Vietnam and Cambodia are the most popular destinations in Southeast Asia, and after a tour of splendid cultural heritage and magnificent temples, you may prefer to have some natural touching. From the rich culture of Cambodia to the amazing colors and culture of Vietnam, and archaeological treasures of Laos. You will discover the beauty and the magic of Southeast Asia through the splendor of three countries. Travel Sense Asia offers some suggestions for you to get the best Cambodia Vietnam Laos tour in order to get a unique experience in a very special part of the world. Discover historic sites besides a bustling life in Ho Chi Minh City and learn about the local life of people in here. Explore the specific of Mekong River as you drift along the maze of waterways that crisscross the emerald green landscape. Be reminded of nature’s awesome conquering power as you stroll around the hauntingly beautiful Ta Prohm ruins in Cambodia. Swim in the beautiful caverns and cycle through a rich tapestry of paddy fields in Vang Vieng, Laos. Enjoy the traditional foods of almost destinations in three countries. Ho Chi Minh City owns modern office, style pagodas, and traditional food and it creates a dynamic urban area in a very special sense. Spending one day, let’s discover the most attractive places the stunning city, which will help you to learn about the history and also the culture of this land. 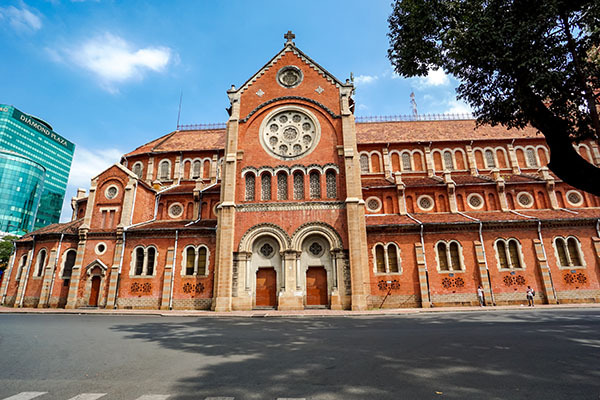 Notre Dame Cathedral is considered the symbol of this dynamic city in the downtown of Ho Chi Minh. Duc Ba church has become a famous age-long cathedral in the Southern region for long years. The Central Post Office is one of the oldest buildings in Saigon in Vietnam. This office is willingly providing all types of the postal services such as selling postcards and stamps. Especially, foreigners completely use the money exchange service in there. The Reunification Palace is a blend of traditional ritual and modern architecture. Independence Palace was built for a long time. The war command room will be set up maps on its walls and equipment. And the War Remnants Museum is well-known as the exhibition relating to the American phase, which is the house for Displaying War Crimes of American Imperialism. Ben Thanh market is the largest market which is displayed the local handicrafts, branded goods, and other souvenirs. However, you should bargain the price of goods you want. Here, you can get a taste of traditional foods and drinks. Ben Thanh market is the place has a lot of delicious foods like spices, nuts, meat and local fruits. You move to Ben Tre approximately two hours and a gateway to the delta. The most famous transportation in here is a small boat, so you can use the one to start your sightseeing around the waterways of Mekong Delta. You should to wake up early and take a boat to the Cai Rang market. Coming here you will see the hustle and bustle of a floating market. From a boat, you can grace the background of vendors display their wares from boats teeming with produce and buy a coffee from one of the floating cafes. The vendors can exchange the goods. For example, they usually change the fruit to rice or daily tools. Especially, you can buy particular items such as fruit, daily tools, traditional foods,…It is believed that the price of these is quite cheap. After that, one recommendation for you is walking around the village and meet the friendly local people and experience how to pass a “Monkey bridge” which is built by only one stem of bamboo. Once considered the most attractive of the cities that the French constructed in Indochina, the city is today recovering from its turbulent past. On the fifth day, you will embark on a comprehensive sightseeing tour of Phnom Penh. Upon arrival Siem Reap, you will meet your guide at Borei Seang Nam station and transfer to your the hotel for refreshment. As you known, Siem Reap is the gateway to the UNESCO World Heritage Angkor Archaeological Park which is roughly 7 kilometers away. Coming here, you will join the night markets you like. And to relax after the processing, you can come to Khmer massage, fish foot massage and a variety of great cafes and restaurants. This afternoon, let’s try one time moving by “Tuk Tuk” to visit the Angkor National Museum, learn about “the Legend Revealed” and see how the Khmer Empire has been established during the golden period. Continue to Preah Ang Chek – Preah Ang Chom, the secret place where local people go praying for good luck or a safe journey. Next, in the dinner, you enjoy buffet dinner with Khmer Traditional Dance Show at Amazon or Kulen II restaurant. One of the important destinations in Cambodia Vietnam Laos tour is South Gate of Angkor Thom. It is known as the gods of the good and evil line the entrance. The temple of Ta Prohm was once used as a location to film the famous Hollywood film, Tomb Raider. Angkor Thom is famous for 54 towers decorated with over 200 smiling faces of Avalokitesvara, the Phimeanakas, the Terrace of the Leper King, the Royal Enclosure, and the Elephants Terrace. Beginning tour to the antique capital of Angkor Thom, you start from the South Gate with the ocean of milk, the Bayon Temple. 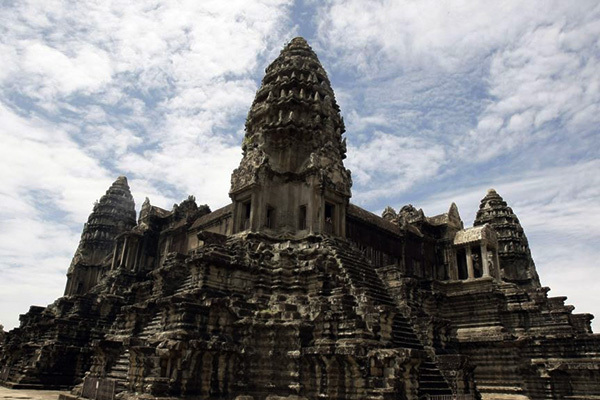 Afternoon, you explore Angkor Wat the most famous of all the temples on the plain of Angkor. Last but not least, you view a wonderful sunset from Angkor Wat or somewhere possible. You will enjoy a quintessential river excursion through the region’s floating villages, where you will get a glimpse of the local lifestyles on the Tonle Sap River. The Lake is famous for the fish consumed in Cambodia so it becomes to the important commercial resource. Towards the end of the day, you will emerge onto the vast expanse of the lake, which is Cambodia’s largest. Chong Khneas is the name of the famous floating village at the edge of the lake. You need to take about 30 minutes by vehicles to Chong Khneas which is located in the Southern part of Siem Reap town about 15 kilometers and there are always boats waiting for visitors. 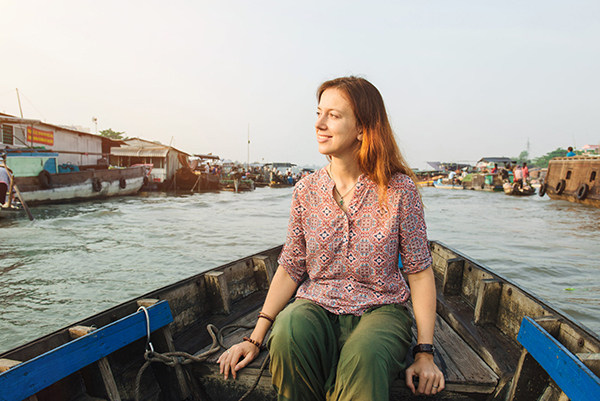 One of the highlights of the Cambodia Vietnam Laos tour is exploring the different culture of Khmer, Muslim, and Vietnamese in the floating households and floating markets and something. 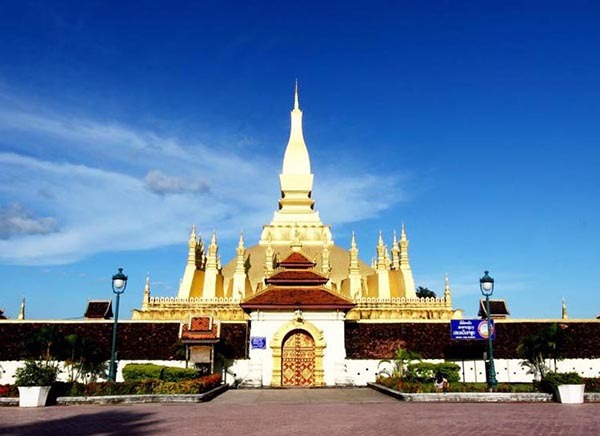 Continuously, you will visit the magnificent Wat Xiengthong with its roofs sweeping low to the ground. This place represents classical Laotian architecture. 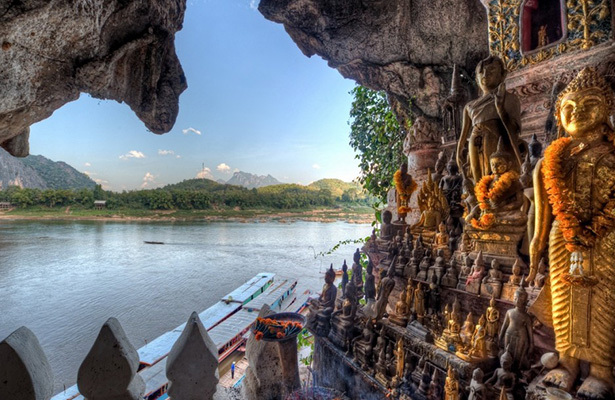 We then embark on a cruise upstream on the Mekong River, which also gives us a breathtaking view of the tranquil countryside, before reaching the mysterious Pak Ou Caves. This cave is combined by two caves created by thousands of gold with many various shapes and sizes left by pilgrims. End route, you will stop at Ban Muang Keo, a well-known village for its traditional Lao rice whiskey distilling. You continue driving by car to visit Ban Xang Khong which is well-known as a village in order to make wood paper and also Lao silk weavings with natural dyes. Your guide tour will pick up you at Elephant Village. On arrival, you will be welcome by the Camp Manager and participate in some traditional activities. After enjoying the impressive experience of 30 minutes for elephant riding on the Elephant seat, then you will take a return boat trip to the Tad Sae Waterfall and spend some time in the clear water. In the morning, you cross Nam Song River to visit several places attracting the most famous tourists in Vang Vieng, the cave of Tham Jang, which was used in the early 19th century in defense against the Chinese invaders. You also cross the river to Ban Huai Ngai, a very pleasant village where we can explore the different local lifestyles. You then start our expedition up route 13 north to Luang Prabang. This place is perhaps the best-preserved traditional city in Southeast Asia. Don’t so worry about the traffic jam, the roads help travelers for a smooth journey; you pass some stunning landscape scenery with a mixture of steep terraced fields and hill villages. Therefore, you take a lot of photos when stopping at some small hill tribe village en route. When you come to some hill tribe villages in Laos, you will have a different feel, some are prosperous but all have plenty of life. The next stop place is Muang Xieng Ngeun village and you spend a short amount of time observing the local lifestyle prior to reaching Luang Prabang. In the afternoon, you leave the capital early for our journey northbound to Vang Vieng; you will see some breathtaking scenery en route as you pass through the spectacular countryside towards the mountainous region. You reach our final destination Vang Vieng, which is nestled on a bend of the Nam Song River. Greatly, it offers the stunning scenery with limestone outcrops remains unspoiled and despite recent developments with the advent of tourism.